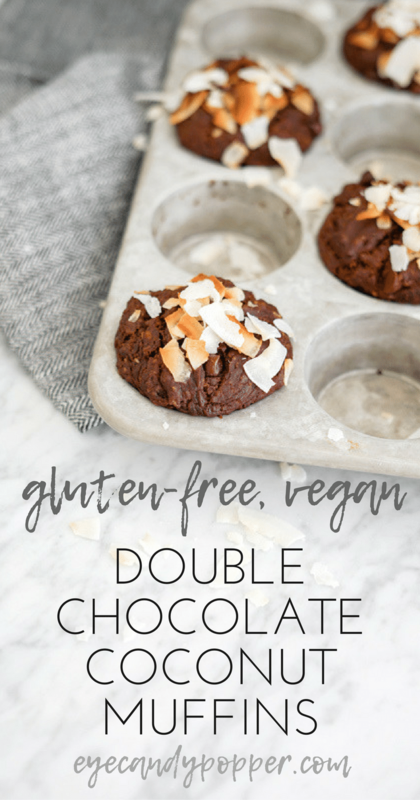 I call them “dessert muffins” because they seem too decadent for a muffin, but truth be told, these Double Chocolate Coconut Muffins are so healthy and nutritious, your kids can eat them for breakfast! 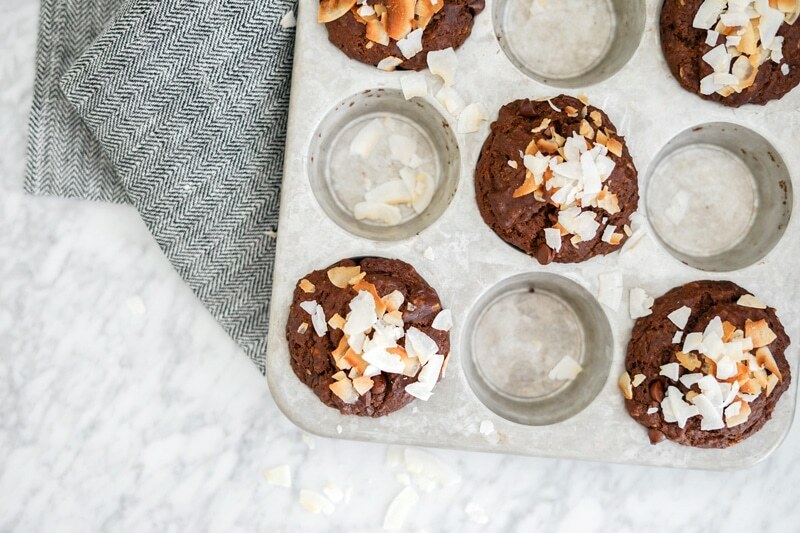 These chocolate muffins are made better-for-you by using some whole coconut sugar instead of white sugar, and using the bananas for their extra sweetness and moisture, as well as helping to hold it all together without eggs. If you eat eggs, you could use eggs instead of the chia seeds, but I recommend giving it a try with chia seeds, to add variety and heart-healthy omega 3s to your diet. 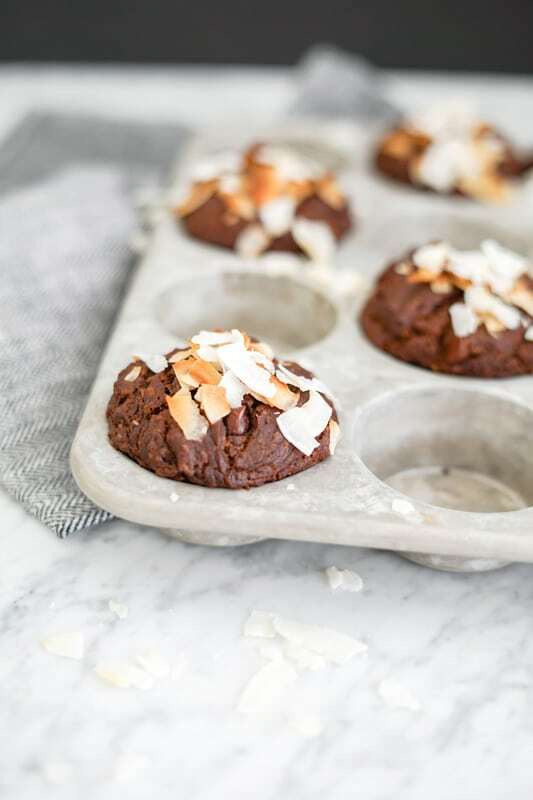 Double Chocolate Coconut Muffins that are as healthy as they are decadent and delicious! 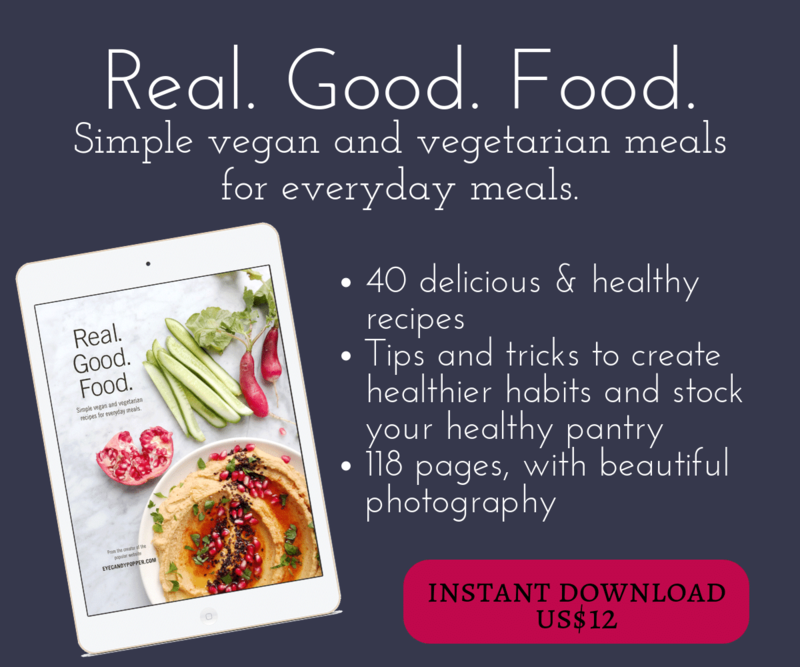 Gluten-free, vegan and refined sugar-free! In a medium mixing bowl, mix the mashed bananas with the olive oil until combined, then the melted coconut oil and olive oil, and then whisk in the soaked chia seeds and milk. Turn on oven to 375F. Add muffin paper liners in the muffin cups. Add the wet ingredients to the dry ones and mix with a spatula until combined and no clumps are left, then add the chocolate chips and gently fold in. Evenly distribute the batter in 10 muffin cups. Bake at 375F for 28-30 minutes. Let cool 10 minutes before eating. You can make 10-12 muffins with this recipe. Keep in an airtight container at room temperature or in the fridge for 3-4 days. Vegan muffins are usually so dense but these were great! These look perfect, and the ingredient list screams healthy and delicious (isn’t is great when ingredients yell at you like that.) I love how the coconut toasted just the right amount for that crispy crunch and added flavor. 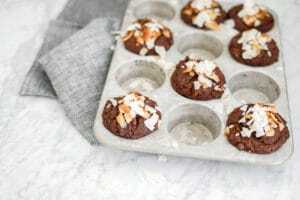 Dessert muffins for breakfast – healthful eating can be so good! I like the bananas in there, as they must add lovely moisture. It’s funny, I’m not huge into chocolate, but there’s just something about an ooey gooey chocolate muffin that makes me want chocolate oh-so-bad! 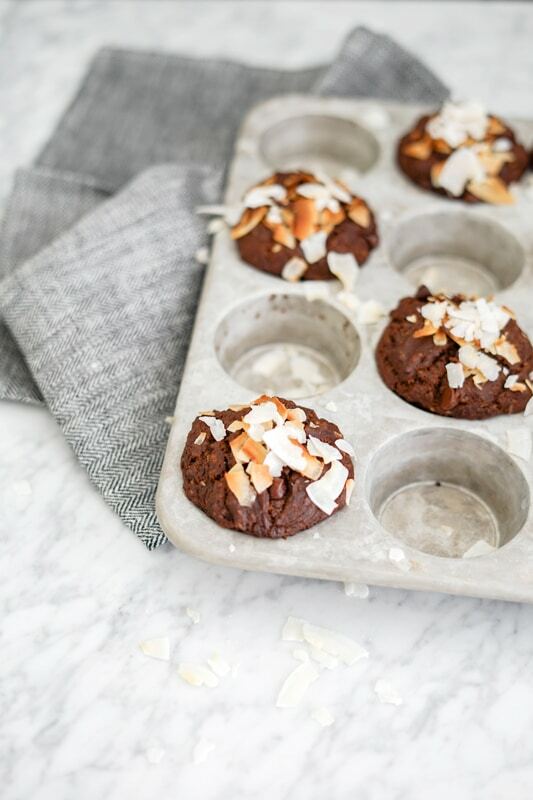 OMG this a super healthy + decadent chocolate muffin is my breakfast of dreams… I have been trying to experiment with coconut flour in some recipes, it never seems to work out for me, so I think I should just go with tried and tested version like this one! Double chocolate is awesome enough as is, but when you add coconut, AND they’re healthy, these are amazing! Thank you! Chocolate can definitely be healthy when done right! I so frequently find myself looking askance at muffins because… well, they’re just cake masquerading as breakfast. I’m not trying to get TOO high and mighty here – I’ve straight up eaten cake for breakfast before. I just believe in being transparent about it. I love your moniker of ‘dessert muffin’ and I must say these appeal in all kinds of ways. Chocolate, bananas, that caramel-y flavour you get from coconut sugar… and somehow they’re vegan? Well done my friend. Suitable for any meal of the day (or any dessert of the day). I would love to try these, but I am allergic to bananas. Any chance you could suggest a vegan substitute? Thank you so much! Coconut flour without eggs is so tricky, way to go! These look amazing! This is my new favorite gluten free recipe I love it!!!! I made it almost every week since you posted it. Great recipe! 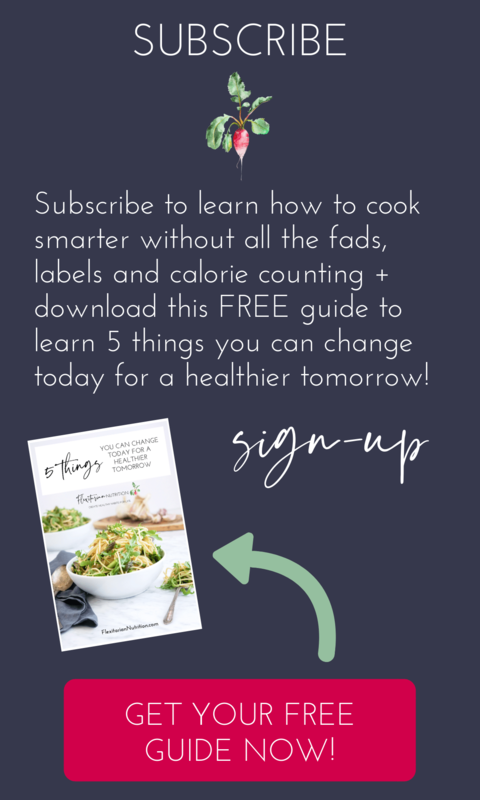 Will replacing the brown rice flour with almond flour work? Hello, yes, any substitution works 🙂 Sorry about the delayed reply, I just saw your comment.